Another Noveller record: what's not to like? Sarah Lipstate's sound has entered our conscious this past few years. We could even view it as a trademark. We know what we get and we enjoy the subtle variations on the theme each new offering brings. It's worth pointing out now that consistently ploughing the same furrow can be a very good thing artistically; just look at Handel or Haydn, Felix the Cat or the Cocteau Twins. And Sarah Lipstate has a good claim to be seen as a “classic” artist; her work as Noveller draws deeply from rock's past, and by doing so, sculpts a clear artistic personality we can draw succour from. Nowt wrong with that. The grand washes of sound, the clever refrains, the flexible riffs that provide structure and a release, they are all here again. But - and this, I suppose is her secret weapon - nothing is ever dogmatic or hidebound about her music. Overall, this record feels much more fragile than the previous release, Fantastic Planet, which at times luxuriated in an ebullient, early-to-mid-80s pop sheen. A quick scan of the titles seems to reveal a degree of soul searching, too; 'Lone Victory Tonight', 'Deep Shelter', 'A Pink Sunset for No One', 'Trails and Trials', 'Another Dark Hour'... All hint at long nights full of introspection and doubt. Further, the new record doesn't have the same frisky impatience as Fantastic Planet, where (noticeable when playing the two against each other) you could be lifted up only to be unceremoniously dropped into another soundscape without a please or thank you. On A Pink Sunset for No One there is an ingrained patience: any answers Lipstate provides can be found, or formed at the end of the record, after the listener has processed the experience as a whole. As well as command of the overall mood, Lipstate always demonstrates a steely command of her influences. But these mini homages don't swamp her sound - quite the reverse. Like Bowie, her inquisitive borrowings are reinvented through a unique, Noveller filter, re-informing her audience. For one, you can hear that forced, synthetic baying guitar sound that conjures up Eno's Before & After Science. And surely I'm not the only person to hear Michael Rother's solo work here (especially Flammende Herzen or Sterntaler) with the beautiful phased guitar blasts which act as counterpoints to the patient structure built up elsewhere. 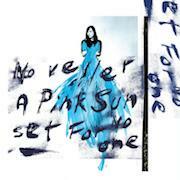 'A Pink Sunset for No One' reminds me of a truly great (and typically opaque) record Will Sergeant made not all that long ago, Things Inside. The track has the same melancholy twang and plodding forbearance, though Lipstate adds Baroque flourishes and sashays that Sarge would certainly have left to one side. Elsewhere, 'Another Dark Hour' is a shifting, ghostly track that never seems to reveal itself fully, some allegorical Grande Masque where the props are reinvented as sonic half-essays. It also displays a great guitar line that sounds like an homage to Glide. One of the LP's key tracks, 'Lone Victory Tonight', begins as a brilliant floating structure, akin to some faerie houseboat, lit up by candles, gently adrift on a lake in Srnigar. Then a more propulsive structure takes over and injects a new, almost ur-math-rock equation, something that you'd imagine Charlie Burchill knocking up round the time of Sons and Fascination. The ending could be a snatched sample torn from T-Dream's Atem. It's a really beautiful piece of music. To reiterate; all of these references only add to the richness and grandeur of her own compositions, there is no suspicion of wanton and unthinking borrowings. Maybe that's why her brand of skillful, ethereal instrumental rock has such power and is such a cut above many others in this field. Still, there is a diffidence present; one that doesn't stand for too much prying. Despite Sarah Lipstate's frank and very approachable nature, listening to this record reminds one of the great Edward Burra who, when asked repeatedly about his work gruffly whinnied, “I never tell anybody anything.” We are drawn into such a game of dissimilation with the last three tracks. The first two of these, 'Corridors' and 'The Unveiling', create a quietly unnerving atmosphere and the latter is possibly the most puzzling piece on the record. It begins “just so”; with a fragile melody picked out over another ghostly landscape of half tones and slightly discordant hints and suggestions. Yet the key moments are towards the end of the track, where the whole sonic shooting match seems to end up lost in a fog, wondering what to do next. Despite reneging on all duties “as a song”, or indeed a “piece of music”, this apparent indecision is incredibly affecting and powerful. This acceptance, of allowing something to run out of steam, is a clever move and confirmed in the end track, the counterpoint, 'Emergence' - where Noveller's trademark pealing, phased guitar runs create a highly romantic and comforting backdrop to banish the gloom. Variations on the grand theme are often the hardest thing to pull off in these impatient, saturated times where the mere suggestion of something new being similar to something already known (regardless of merit) means instant dismissal. And Noveller is nothing if not consistent in what she does. But worrying about the socio-cultural zeitgeist should really be the least of your concerns, especially when ripping the shrinkwrap off a new Noveller LP. If you are in the mood to indulge in some of the mood games that Lipstate likes to play, you are in for a treat with this record.